Building new structures, properties, and performance. This expanding field of pure and applied science relates the nanostructure of a material to its macroscale physical and chemical properties. By understanding and then changing the structure, material scientists can create custom materials with unique properties. 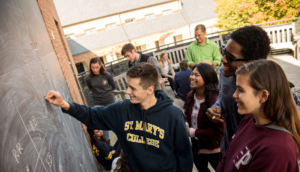 The St. Mary’s materials science curriculum creates a cross-disciplinary approach with each student gaining experience and perspectives from the disciplines of physics, chemistry, and biology. The materials science Minor program creates an environment where faculty and students work collaboratively toward solving issues with applied science. Students gain experience in the lab solving real-world issues to address some of our most pressing challenges. 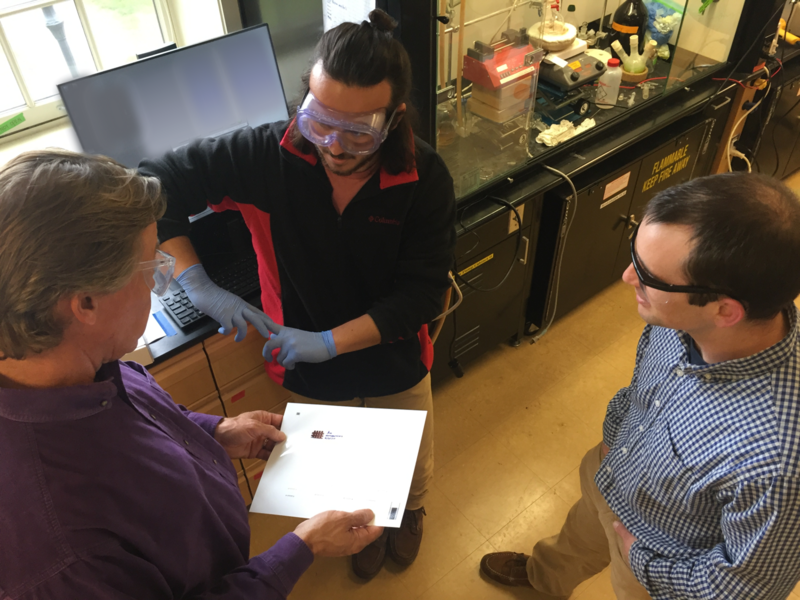 Here Nick D’Antona ’19 explains his nanocrystal film patterns to industry partners. Could Materials Science be for You? If you are interested in nanomaterials, functional coatings/films, electronics and nanobiomedicnine, this minor could open doors to new opportunities. Whether your focus is biology, physics or chemistry, materials science is an interdisciplinary field that bridges gaps between established departments so that scientists can approach problems with diverse perspectives. so MATH 151 and PHYS 141, for example, can also both be taken during the same semester.